I’ve done guanciale many times before, so this really isn’t anyhing new. What’s IS new is the cold smoke I applied to it before putting it into the curing chamber. You may notice the addition of sodium ascorbate to the curing mix, this sounds like some crazy chemical, but sodium ascorbate is nothing more than viatmin C. Vitamin C is used to reduce the formation of cancer causing chemicals called nitrosamines which are formed when nitrItes are cooked at high temperatures (such as frying). Since i often cook my guanciale and pancetta at higher temps, I’ve been giving this some thought. I’m not sure how necessary this is for a dry cured product, as I would think that over the 3-4 months the guanciale or pancetta hang, the great majority or all of the nitrites in the product have already reduced to nitric oxide, meaning no nitrosamines would be formed anyhow. Since i’m not certain of my last statement, and since this is really just vitamin C, and since it doesn’t affect flavor, I decided to add it in an abundance of caution. Not much new, as I said. The cure mix was applied to the jowl, vacuum packed and refrigerated for about 2 weeks. It was then rinsed and dried. This was a Caw Caw jowl. Always great stuff. It was cold smoked (about 50 deg. F) over hardwood for about 24 hours and then hung in the chamber at 55 deg. F and 75-80% RH. I use a Pro-Q Cold Smoke Generator to cold smoke. After about 4 months it was removed and eaten. It lost about 15% of its weight. I think the pictures do this guanciale affumicato justice. It’s incredible. Its super rich, and the smokyness is just right. Its great stuff in amatriciana or carbonara. I love it. Really nice. Does the high fat/meat ratio eliminate the need for casing this? flat pancetta an guanciale don't get cased. Their surface area to thickness ratio doesn't require slowing down the drying with a casing. 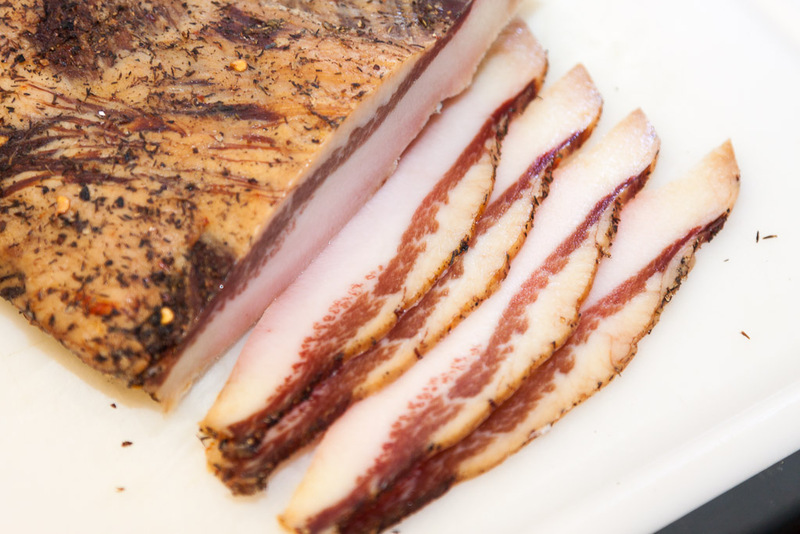 i posted this reply in your other post on guanciale, and i figured i could ask here in case you have more chance on reading a post to a recent thread compared to something from 2011.
basically, in one of your replies you said you would comment on a way to dry this in the fridge. i'm just curious how you would do that since i'm still several months away from convincing my wife to let me use a storage room for the curing chamber. thanks for this amazing blog. its just fantastic. keep it up. Sorry Simon, i answered the question maybe in comments, i should make a full post on it. Basically, just put it on a wire rack in teh fridge for about 3-4 weeks. If it dries out too much just wrap it in a damp paper towel and put it in a zip bag for a couple days. What kind of hardwood did you use? I've been using Oak for regular bacon and really liking it. It was smoking sawdust labeled "mixed hardwood" don't know the specifics. question not related to this post...how did the frozen lardo end up when you took it out of the freezer ? was it the same texture/taste as before ? Yup, the lardo is fine. I vacuum packed it and froze it. Hello. Bookmarked your blog some time ago and stop in from time to time. You surely do make some awesome stuff. I went the traditional route and didn't smoke mine, but was curious about. Think I might do that next go around. For those who haven't attempted to make this, all I can say is you are missing out. Great stuff. Made Spaghetti alla Carbonara the other night with it. Awesome stuff. On you title, you list it as Guanciale Affumicato. What does Affumicato mean? Is that a different variation? So my curing fridge is tiny, and having this take up space for 4-5 months is out of the question. But I do have a large industrial walk in fridge with plenty of space. I was thinking of using my curing chamber for a month and then transferring it to the fridge after. What are your thoughts on this? adding vitamin C might INCREASE the cancerigen, and not reduce it ! Simon, that's really interesting. Thank you for pointing this out. I will do some further research! yes, i was pretty shocked about reading that. it certainly could use more research, but as of right now, i will definitively not be putting any vitamin C in my cured meats no more. as soon as i saw the video/study, i thought about this post about your guancale and came right in to post it. btw, my fridge dried guancale was fantastic stuff. surely not the greatest i've ever tasted, but for something done in the fridge, marvelous. unbelivable on pizzas.